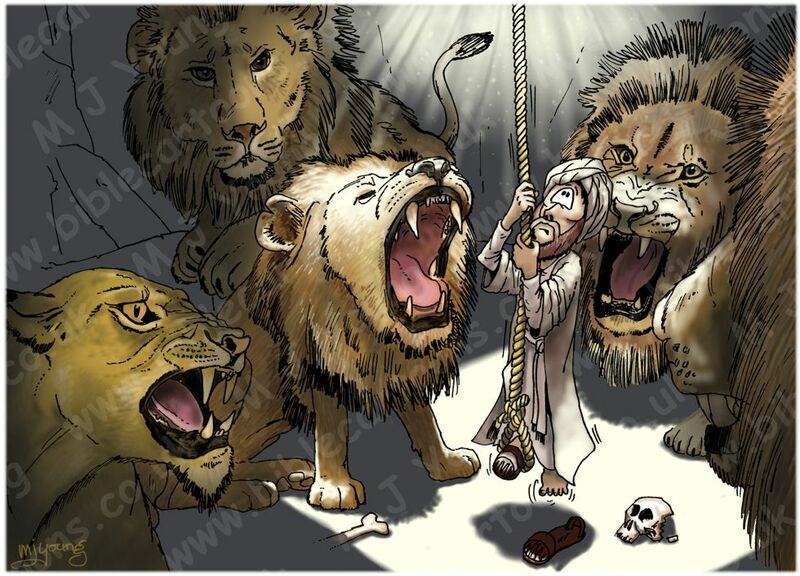 The exact time that Daniel was “thrown” into the lions’ den is not given. I have assumed it to be during the afternoon. The light for this scene is streaming down from the opening to the den, which is in the ceiling, above. Daniel & the lions (Panthera leo). 01) (This page) Daniel 06 – The lions’ den – Scene 08 – Into the den. This is the original version of this scene, which includes a skull on the ground. 02) (Next page) Daniel 06 – The lions’ den – Scene 08 – Into the den (no skull). This is the same scene as above, with the skull on the ground removed, for those customers who don’t want to see that in the picture! This scene shows Daniel being lowered into the lions’ den. I have assumed an opening to the den to have been in the ceiling above, through which people could be lowered, or thrown. That would stop the lion’s from escaping through the same opening! Since Daniel was favoured by King Darius, I have assumed that he would have been lowered on a rope, rather than literally thrown into the pit! 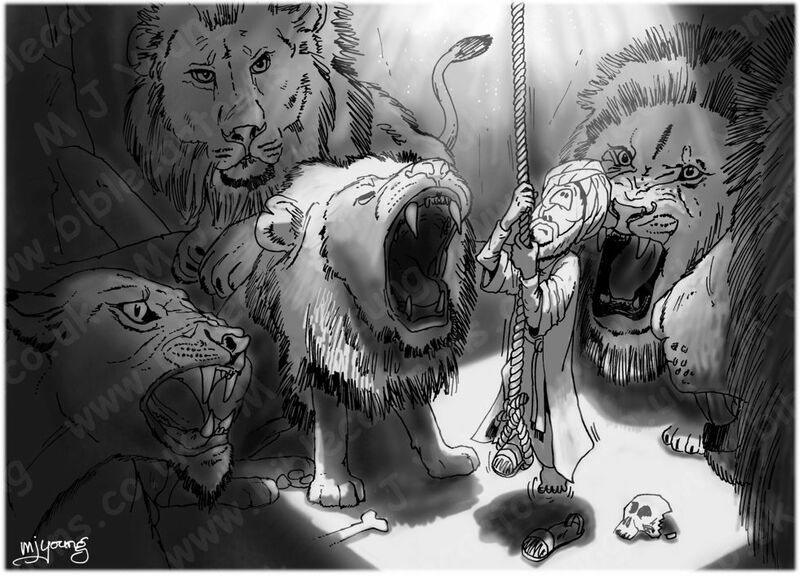 I’m pleased with the strong lighting used in this illustration, & the deep shadows that almost hide the fearsome lions, making them mysterious and more scary! I was asked to remove the human skull in the picture by a customer who wanted to show children this scene – fair enough, I don’t want to scare anyone, hence I’ve made this scene available, without the skull, on the BC website (see next page).